being little • bristol uk fashion & lifestyle blog. 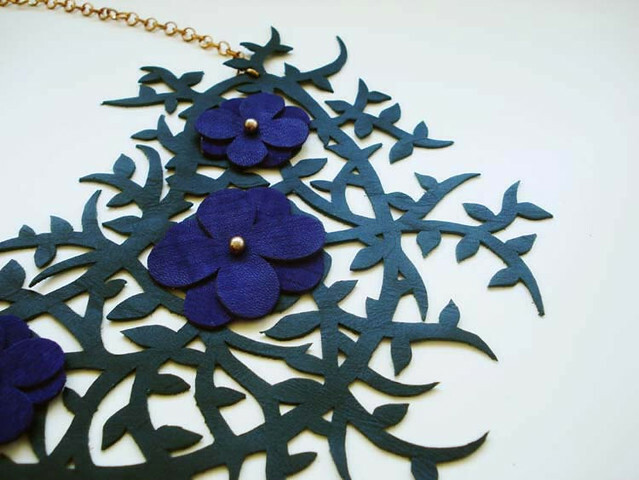 : leather jewellery giveaway! I was recently contacted by the lovely Sare, the skilled lady behind Miss Fluff Jewellery. She makes amazing pieces out of leather, and I've never seen anything like it. It's my birthday this week, and as a present to you guys, I'm giving you the chance to win a piece of your choice from the Miss Fluff Jewellery Etsy shop! Details of how to win after a few words from the lady herself..
"I’ve made my own bags and jewellery since I was a girl. I learnt my sewing skills from my mother and grandmother who were both dressmakers and would always be sewing something in our kitchen. I briefly studied Fashion Design at The London College of Fashion when I was 16-17 but left and worked in the education sector for a long time and after a gap of nearly 10 years decided to return to the London College of Fashion to study Accessory Design which I did for 3 years. While I was studying accessories at LCF I discovered the wonderful properties of leather and learnt the skills I needed to work with it. I love working with leather. It’s so tactile and I find it only improves with age. I’ve always lived in London and although I love living in a busy city like London I’ve always craved the country and perhaps that why my main influences are nature and wildlife. I’ve also always wanted to live in a fairytale wonderland which is perhaps why sometimes my designs veer off into the slightly odd! I’ve always loved unusual jewellery and I like to think that my designs fit into that category. Whilst some of my work is more conventionally pretty there are other pieces that are a little more unusual like my horse earrings, sea life creatures or bunny rabbit necklaces." - visit and follow Miss Fluff on facebook and twitter. This competition is open until Monday the 21st of May, when I will pick a winner at random! Wow, what an amazing giveaway, some beautiful pieces in your shop Sare! I'm following on Twitter as @JesssXD and liked on Facebook as Jess Smith. she does amazing work !! beautiful give away! I've liked Miss Fluff jewellery on facebook and followed on twitter. Those earrings are so cute! I love the mis-matched nautical ones too, they're so cool. These are adorable! Wish I took up a hobby like that when I was young, I wouldn't know where to start now! What's a design really wonderful. It is one of the best fashion jewelery market to online purchase. There are increase woman beauty. Hope you have a lovely birthday tomorrow! I've liked the fb page as Lisa Merriman, and on twitter as lisamello. Love this giveaway! And what would you know it's my birthday on the 21st too :) I'm following Miss Fluff on facebook, and can be emailed at emmaherself [at] gmail [dotcom]. Same email address links to my fb. 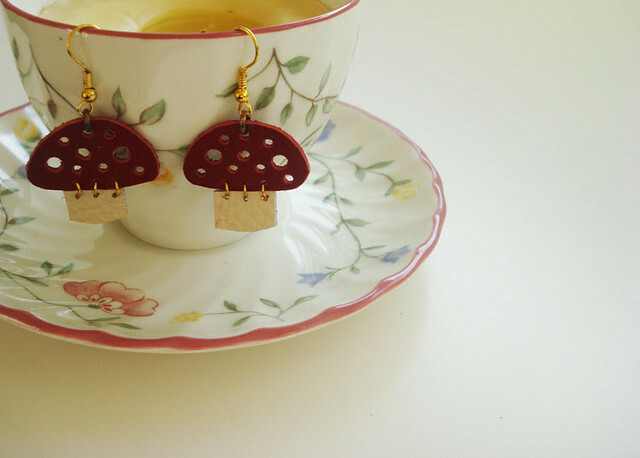 oh goodness those toadstool earrings are adorable! Lovely, make me want to be crafty and make some of my own! Followed on twitter @LauQUINN, and liked on Facebook. Her jewellery is so unusual and beautiful!